A rich mosaic of diary entries and letters from Marilyn Monroe, Cesar Chavez, Susan Sontag, Albert Einstein, and many more, this is the story of Los Angeles as told by locals, transplants, and some just passing through. The City of Angels has played a distinct role in the hearts, minds, and imaginations of millions of people, who see it as the ultimate symbol of the American Dream. 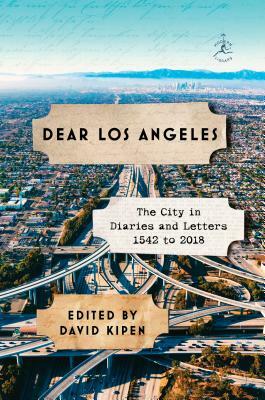 David Kipen, a cultural historian and avid scholar of Los Angeles, has scoured libraries, archives, and private estates to assemble a kaleidoscopic view of a truly unique city. From the Spanish missionary expeditions in the early 1500s to the Golden Age of Hollywood to the strange new world of social media, this collection is a slice of life in L.A. through the years. The pieces are arranged by date—January 1st to December 31st—featuring selections from different decades and centuries. What emerges is a vivid tapestry of insights, personal discoveries, and wry observations that together distill the essence of the city. As sprawling and magical as the city itself, Dear Los Angeles is a fascinating, must-have collection for everyone in, from, or touched by Southern California. David Kipen was born and raised in Los Angeles. He founded the nonprofit Boyle Heights lending library Libros Schmibros in 2010. Former literature director of the National Endowment for the Arts, book editor/critic of the San Francisco Chronicle, and contributor to multiple volumes of California cultural history, Kipen teaches full-time in the UCLA writing program. A familiar voice on public radio, he also serves as book critic for Los Angeles magazine and is critic-at-large for the Los Angeles Times.